If you’re a massive Lord of the Rings fan (like me), then there’s a phrase that’s always ringing around your head somewhere when you hear someone talk about royalty: “The hands of a king are the hands of a healer.” It’s from Return of the King, and it’s actually how Aragorn is identified as the true king of Gondor. When he appears, he has been in the fight and on the battlefield, but he takes some time out to go to the Houses of Healing and help Merry and Eowyn, who were both greatly wounded while battling the Witch King. Aragorn goes to them and painstakingly heals them. It’s hard to explain, but basically the book makes it clear that he was the only one who could have saved them, and he did. While there, one of the healing women, Ioreth, realizes what this means, and freaks the crap out. For pretty good reason, too. Gondor hasn’t had a king in centuries, and here’s Aragorn, just popping in for a quick heal in between battles. Anyway, that is not the point of our little chat today. Not exactly. It’s more that I want to talk about the corollary to that point. You see, if the hands of the king are the hands of a healer, which seems well and good to me, then what about the queen? What’s she all about? If you read the title of this article, then I think you can guess. The heart of a queen is the heart of a servant. I don’t mean any old queen, of course. There are bad queens and wrong queens and mean fairy-tale queens. And of course, aging, flamboyant queens. But when I say queen, what I really mean is Queen. That innate idea of royalty that resides inside us. Plato’s ideal form of Queen-ness, if you want to get all philosophical. What I mean is, Guinevere from Merlin. Merlin was (sob!) a BBC drama about the early years of the Arthurian legend. Before Arthur was king, before Morgana was evil, and before Merlin was an epic wizard. It takes a lot of liberties with the story, but there isn’t a lot of story to begin with, so you don’t mind much. Basically, all the characters you know and love are in their early twenties, and hijinks abound. There are, however, some radical departures. 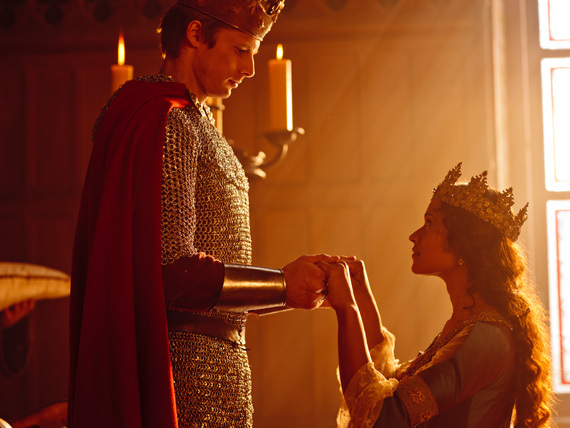 For starters, Arthur (Bradley James) here is well aware of his royal heritage. He is son of King Uther (Anthony Stewart Head, aka Giles), and being groomed for rule. Also in the house is the Lady Morgana (Katie McGrath), who is King Uther’s ward and Arthur’s probable future wife. 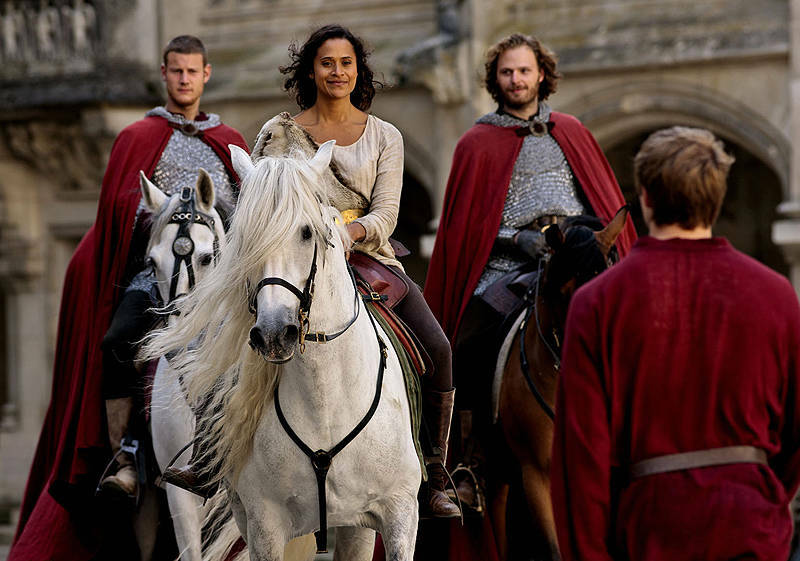 Oh, and Guinevere (Angel Coulby), Morgana’s maid. Have some Gwaine. Just because. Yup. You heard that right. Guinevere, or Gwen as she’s more usually called in this world, is Morgana’s servant. She’s also black. I like this show. Anyhow, there’s a whole thing about Merlin (Colin Morgan) coming to town and saving Arthur’s life and becoming his manservant, and also how magic is outlawed, and everyone is always trying to kill the Pendragon family, but what we’re really concerned with here is Gwen. She is a servant, and she becomes queen. Well, the obvious answer is that Arthur falls in love with her. And man is that a long and slow process. Arthur, who believes strongly in the traditional paths to power and has long since accustomed himself to marrying someone for politics, is very slow to realize that he has feelings for Gwen. Gwen, who usually thinks Arthur is a prat (rightly), is even more reluctant to give in. Plus there’s the whole thing where Gwen’s mistress is slowly going insane and trying to kill everyone, and Gwen’s best friend (Merlin) is about as helpful as a chainsaw on an inflatable raft. When it comes down to it, though, the reason Arthur falls for Gwen is really simple: her heart. Gwen isn’t a servant because she has to be. I mean, she is at first, when she’s working for Morgana, because her family just isn’t that well off. Her mother has passed away, her father is a blacksmith, and her brother seems to have run off and found trouble (we later meet him, and man did he meet trouble). Gwen works double duty taking care of a noblewoman and her father, and she never really complains. She even trains Merlin in how to be a servant without stressing about it. You could say this is bad writing, but there’s really something more going on. When Morgana finally drops the shoe and shows how nuts she is, Gwen doesn’t quietly retreat from the castle, or find some other job, or even let Arthur pay her to genteely retire (like he tries to). Nope, she sticks around, serving and helping out. Arthur tries to promote her, but she keeps on serving. Why? Because she likes to. Because helping people makes her happy. There’s an immediate instinct with people to assume that they always have an agenda. That they want something. Morgana sees that in Gwen. Hating the idea of a commoner sitting on “her” throne, Morgana insists that Gwen is only interested in Arthur and power. But that isn’t true. Gwen likes helping people, and she believes in standing up for what’s right. She also doesn’t think that Arthur will remember to do the right thing if left alone (again, rightly), and decides that the best place for her to be is by his side, even as a servant. I really, really don’t have that kind of humility. Or dedication. Or, well, anything. But I want to. Gwen is a great Queen because she has a great heart. She truly believes in people, in the importance of them and the good they can do. When she betrays Arthur, she does so unwillingly, and when she returns, she keeps her head held high. She is a Queen beloved by her people because she truly cares about them, and because she was one of them. I truly believe that this is important. There’s a saying I’ve always liked a lot: “The best leader is the one who doesn’t want to but does it anyway.” I mean, it’s not always true, but it says something really important. The most effective, most effecting leaders are the ones who don’t necessarily want the power of leadership, but do want to effect change. The ones who believe in what they’re doing enough to do it even if no one follows them. Gwen doesn’t want power, she doesn’t want glory, and she doesn’t need riches. What she wants is to make Camelot great, just, and good. If she has to clean chamberpots to do it, she will. That is what I want from my leaders. The hands of a healer and the heart of a servant. I would also like a fabulous crown, if anyone is taking notes. Gwen is amazing. I love Gwen.